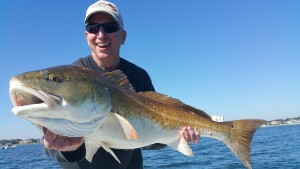 Since mid November Perdido Key fishing has been as good as I have ever seen it. This year’s warm temperatures and high salinity have thousands of Redfish sharing the bays with loads of baitfish. Acres of these big girls can be found feeding on the surface and crashing bait as far as the eye can see. It is truly light tackle fishing and fly fishing at its finest. Be sure to check out the recent videos on our Facebook page and see client comments. There is not a better time to make a memory on the water with a friend or family member.